This trail undulates up and down and around peaklets forming Tronsen Ridge, and gives views of Rainier, Adams and St. Helens to the south as well as Glacier Peak to the North. This is definitely a “highlight” trip or one of those “Top 10”–nearly every step has a view. 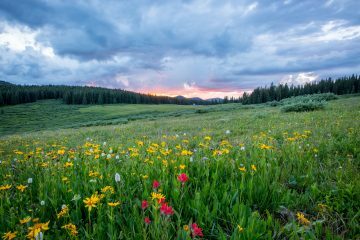 Besides the scenery, the flowers are spectacular in spring through mid summer. Finally the grunt-quotient is relatively low for such a high trail–you start high and stay high. For mountain bikers, the ride is also plenty technical and will test both your climbing and descending abilities. 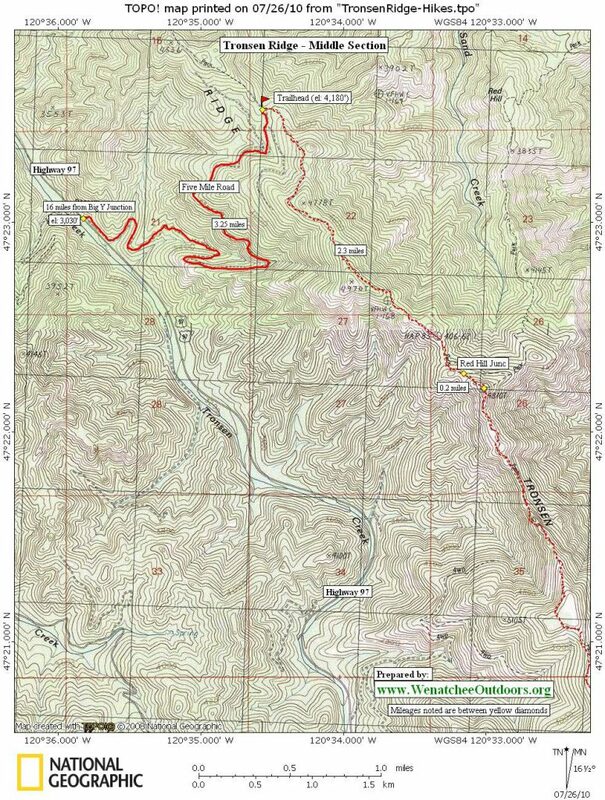 Maps: USGS 7.5-minute series: 1) Swauk Pass for southern portion of route 2) Tip Top for northern portion of route. Skill: 2 or intermediate for hiking, 3 or advanced for mtn biking. 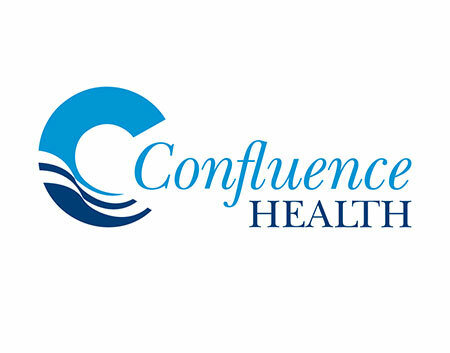 Fitness: 2 or intermediate for hiking, 3 or advanced for mtn biking. 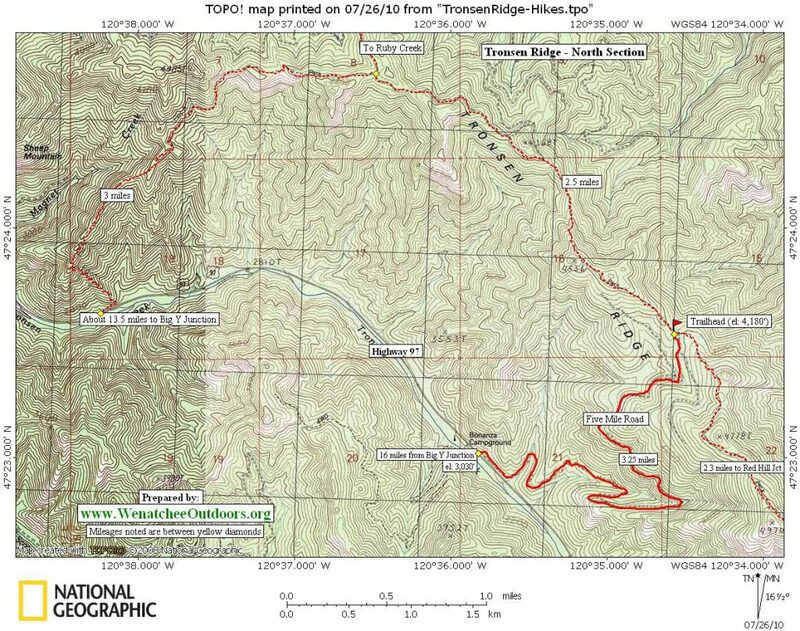 Distance: The trail along the top of Tronsen Ridge is about 6.5 miles between the Blewett Pass environs and the Five Mile Road. Hikers can simply follow the ridge as far as time and energy allows. Access. If approaching the hike from the south/west side (e.g., Seattle) of Blewett Pass, the southern access from Blewett Pass makes most sense. If approaching from the Wenatchee River Valley (the North), approaching from the Five Mile Road is quickest and gets you into a more remote section of the trail. Access from Blewett Pass: Immediately west of the highpoint of Blewett Pass (elevation 4100’), turn left (south) on Forest Road 9716. Drive 3.5 miles, then turn left onto Road 9712. About 4.7 miles farther, reach Haney meadows. Roughly 0.75 miles past Haney Meadows, the road takes a very tight turn and crosses a small creek (Note: there may not be water in the creek in autumn). Elevation here: 5620′. A rough jeep road heads uphill (in a northerly direction) following the drainage of the creek at this tight turn. Park off the road anywhere you can and then walk the jeep trail 0.8 miles uphill (heading due north) until you reach the sign marking the start of the actual trail (el 5840′). Trip Instructions: 1) There’s not much to it. If starting from the Five Mile Road, walk southeast along the ridge. In about 2.3 miles, you’ll hit the trail junction where the Red Hill Trail splits off to the left. Keep going straight and remain on the ridge. Another 4 miles gets you to the trailhead on the south end of the ridge. Hikers, retrace your route here. 2) If starting from the south (Blewett Pass area), head north or northwest along the trail following it on the crest of the ridge or contouring below some of the rocky peaklets capping the very crest of the ridge. About 4 miles from the car, the Red Hill Trail splits off to the right. Go straight, continuing to walk in a northwesterly direction and remaining on the ridge. In another 2.5 miles, you’ll hit the Five Mile Road. Note for Mtn Bikers: Hikers love this trail because it starts high and stays high. 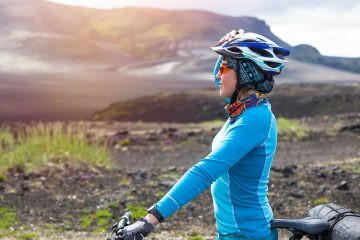 From a mountain-biking point of view, however, most riders will find themselves pushing the bike a fair bit heading south (overall you’re climbing). Starting at the southern trailhead near Haney Meadows is initially easier –especially if you turn around about 4 miles out at the junction for the Red Hill Trail. Any way you slice it, expect to push the bike on some of the uphill’s. 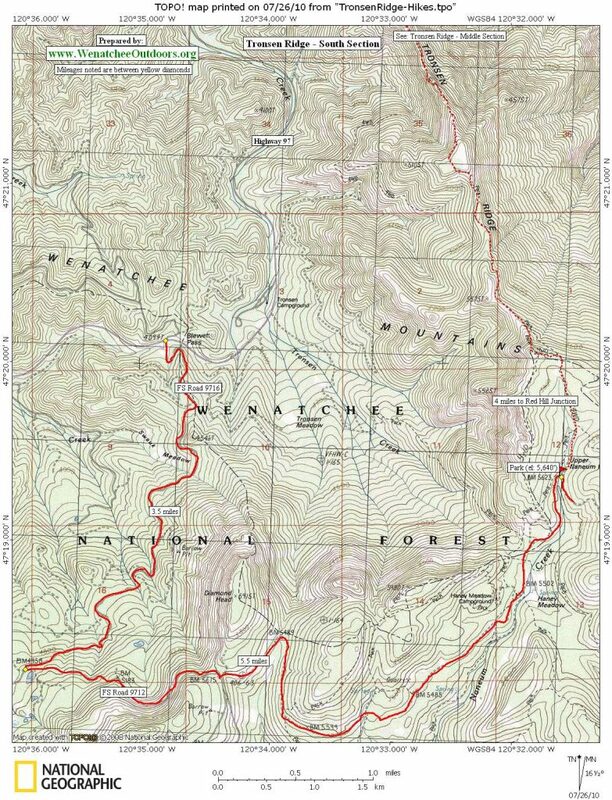 Maps: See our topo maps for: 1) middle section (access from Five Mile Road); 2) southern section (access from Blewett Pass); 3) northern section. Fees/Permits: None as of September 2005 Uses Allowed: Walking, mountain biking, motor bikes, horses. Though motorcycles are allowed, you’re not unlikely to see many. Additional Information: Click here to read the Seattle PI’s report on this trip.